Centering Around Science is a collection of science centers for students in grades K-3 that provides hands-on experiences with science concepts and skills. These centers focus around the processes of science such as observing, predicting, measuring, sorting, recording data, and making conclusions. The idea is for students to read the story, then to visit different stations with different types of rock. At each station they will record properties on their lab sheet. This is a chart to help with a rock investigation and inquiry. There is a chart to find the properties of 5 differnt rocks. There is also a Venn Diagram to use to compare 2 rocks and their properties. Students can use sample rocks and discuss properties. 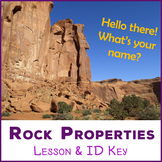 Record the properties and label and draw the rock. Great for a science investigation on rocks. Can be used for the 3 different types of rocks. 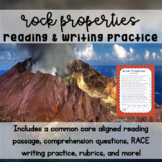 This booklet is a fun way for students to record information they learn about the properties of rocks. 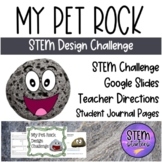 This booklet makes a great resource during hands-on rock exploration. Use this lab sheet for younger students to observe and record the properties of the rocks you have placed at the stations. This is a package that contains sorting mats and task cards for use in stations after instruction of properties. Includes a work page for the final station. 5 Stations including: streak test, weight measurement, uses of minerals, vocabulary, luster. All aligned to Florida Standards. This is a Smartboard activty that you can do with the students to review Rock and Mineral properties. There is a chart on the last page that you can print out for the students to record their answers.